Hello and welcome! 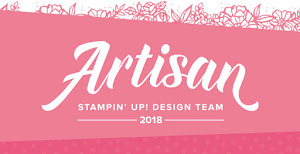 Yes it's that time again and this month the Stampin' Up! Artisan Design Team are providing you with inspiration using the Garden Impressions suite of products. So this time my projects are all about ink blending. So Sponge Daubers at the ready! Let me explain my projects to you. Now the first rule of ink blending is that you start lightly and build up the colour - you can always add more but it's very difficult to take it away! 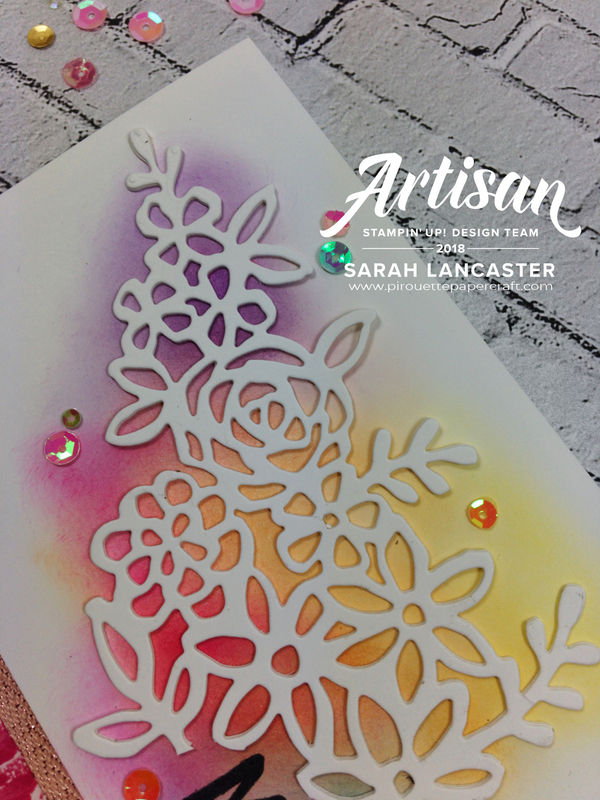 For my first card I have used So Saffron, Mango Melody, Melon Mambo, Pumpkin Pie, Highland Heather and Shaded Spruce ink pads. 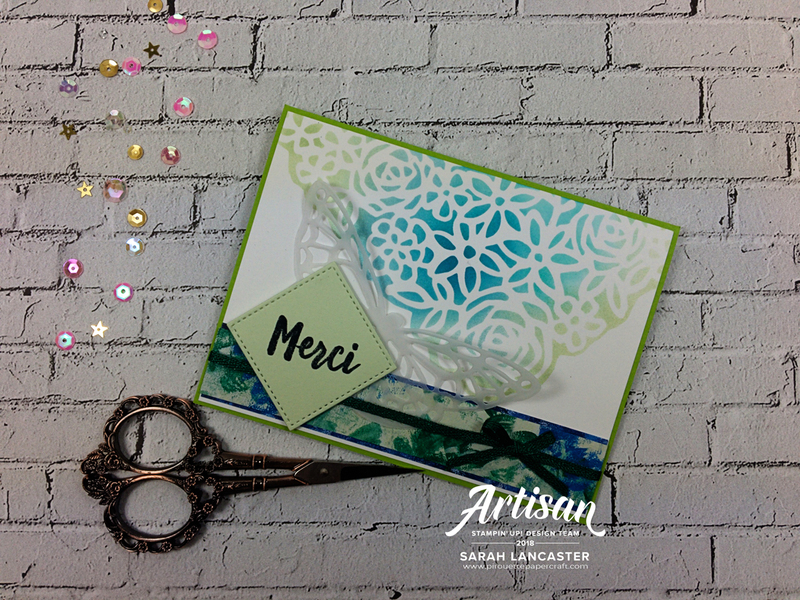 I die cut the image three times to give more definition, and you can see I altered the imaged slightly so I had room to stamp my greeting. 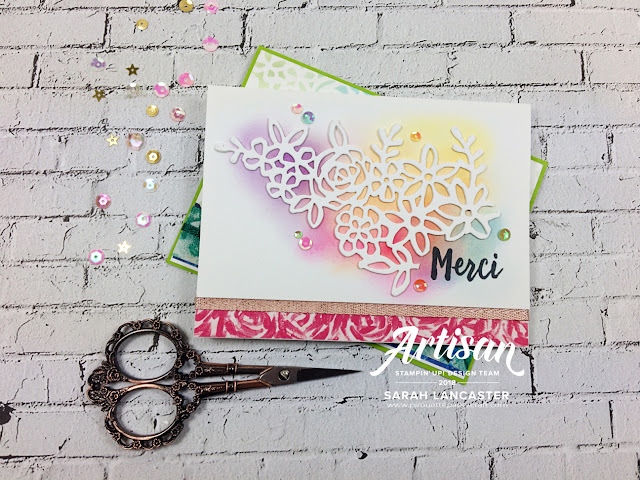 For my next card I used the die cut like a template or mask. Then I ink blended into the negative space, this time using Soft Sea Foam, Coastal Cabana and Pacific Point ink pads. Here's a close up of my ink blending, getting gradually darker towards the centre. Here's a tip for you! After you've finished ink blending, lightly waft your card piece through the air where you've sprayed water with your Stampin' Spritzer. This helps the inks blend together better. Now of course my projects wouldn't be complete with a little gift bag! I followed this tutorial from Stamping with Tracy and I made adjustments because Tracy works with 12" x 12" DSP and the Garden Impressions DSP is 6" x 6". You need to take two matching sheets of DSP and cut 1" off one side. Then glue the two pieces together with 1" overlap so that you now have a piece of DSP that measures the required 6" by 10". 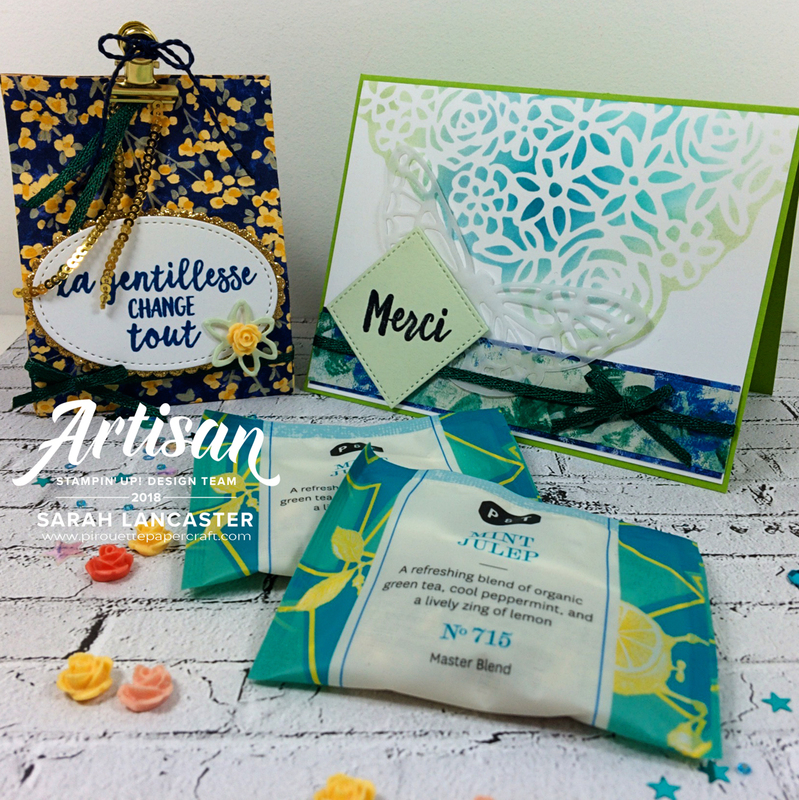 Tracy has a video on her blog that shows all the steps to make these gorgeous gift bags! Thanks Tracy! 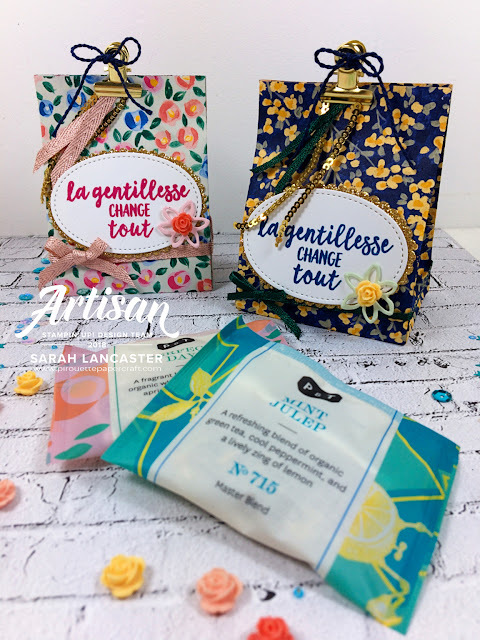 This is the girly version for one of my work friends, the two tea bags fit perfectly inside for a quick but stunning gift! 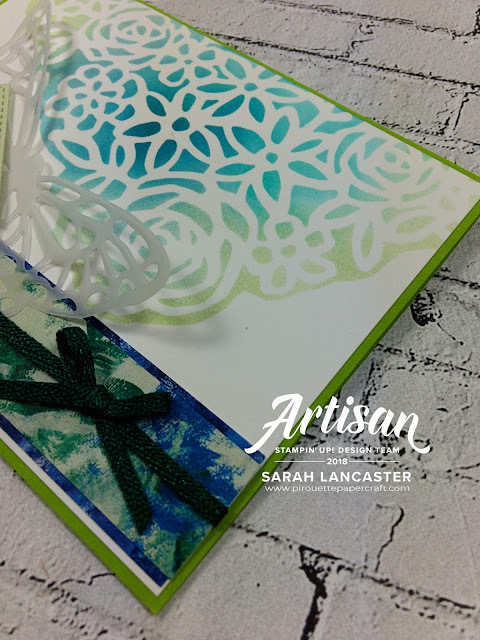 And below is the more masculine coloured one that goes with the green and blue ink blended card. And here they are both together! So I hope that you love my creations and that they gave you some inspiration. On the other side of the world you will hop to Susan in New Zealand and see her awesome projects. But come back soon! J'adore tes creations Sarah! vraiment chouette! Fun with colours! These are really amazing Sarah! Love the girly as well the more masculine ones, they are both great! Beautiful soft sponging, what a gorgeous effect! So many lovely projects and colors! You really had fun with this suite! Great job! Wow these are just stunning and the colours are breathtaking! I love bright colours and you have rocked it! That tea bag holder is just gorgeous! 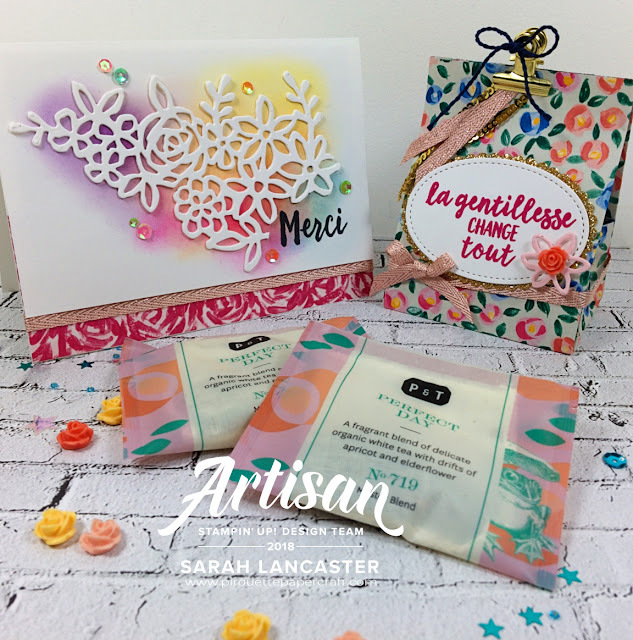 I love your backgrounds with soft sponging! Beautiful colors blending and layouts. Love your projects. Bold backgrounds and soft sponging make a beautiful combo. Love these!